This past week flew by in stitches....lots of them! 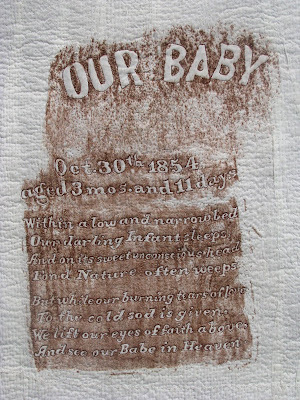 For one thing, I finished another piece in my Grave Rubbing Art Quilt Series. The work is developing in a new direction. 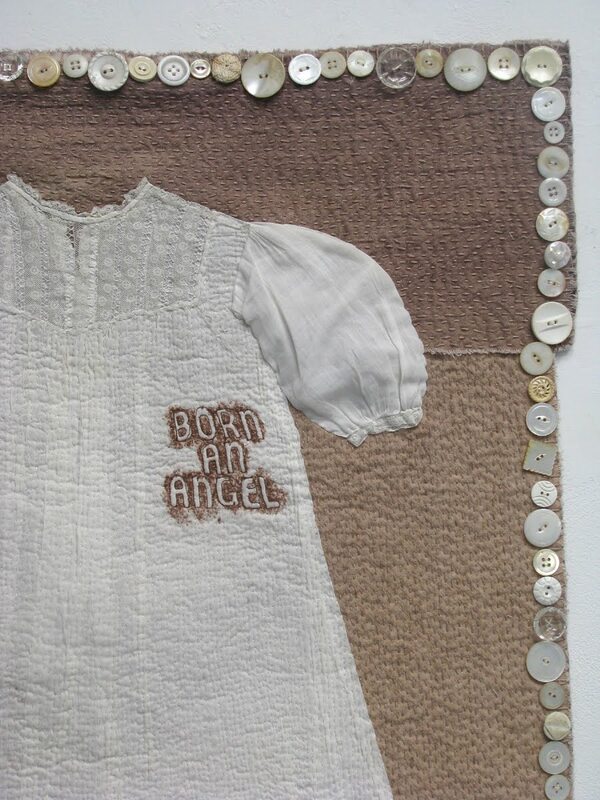 I'm incorporating garments or found objects as visible signs of a human existence. Also,the focal point is not necessarily the words. This piece took over three weeks to complete and has at least one stitch per every square quarter of an inch....yes, I know....I'm more than a little obsessive! This is the very last of the severely light damaged curtain that I recycled from an office located near Gallery 80808/Vista Studios. There were three, very long (nearly16') panels in the trash. I took only one....and walked back to my studio thinking, "What are you going to do with this old, dirty thing? Why are you taking it? You don't need it or have room for it!" But, I did shove it into a storage box....for a short time....until I realized that it was the PERFECT COLOR for my grave rubbings. Since then, I've used it on about fifteen art quilts. Now there's no more. I'm going to miss this material...but I'm also on the look out for other post-consumer fabrics, especially those that have a little "history" to it, signs of wear and use! 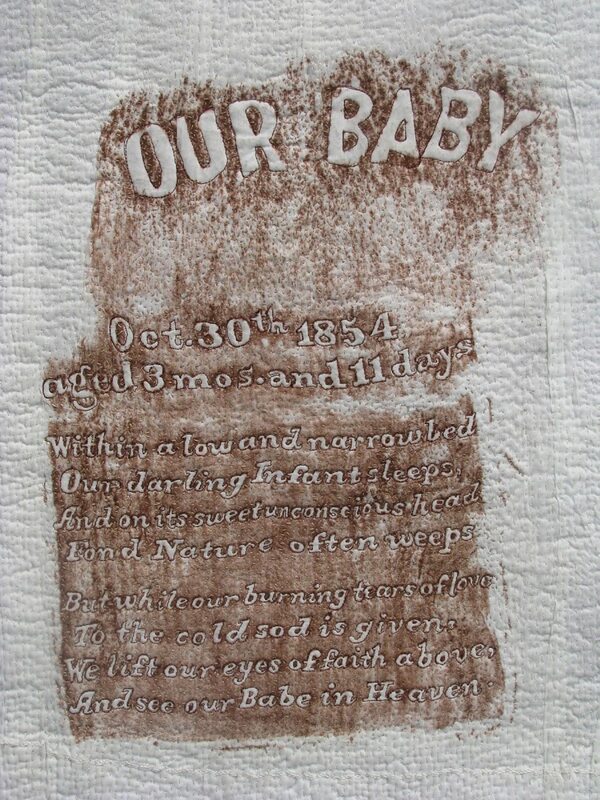 This is the first Grave Rubbing art quilts that I've designed while in a cemetery. 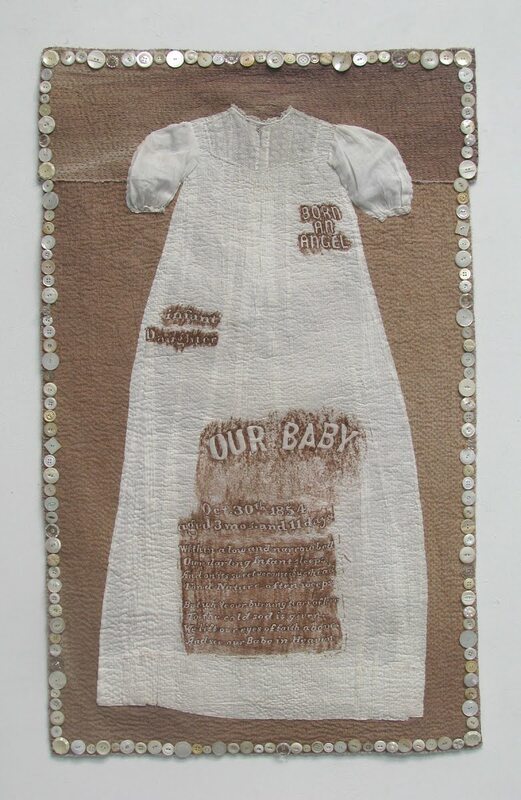 I put the grave rubbings directly onto the garment instead of making rubbings on separate material and collaging them. Fortunately, I'm familiar with the local cemetery...a place where I've collected epitaphs. So, I knew exactly where to get the poem. I walked around for over an hour....looking...searching....selecting the other three rubbings: our baby, infant daughter and born an angel. There is a special feeling making grave rubbings this way....awareness of very specific memories. I saw and felt new things in a familiar spot. The poem is quite touching. It was written for a child who died more than one hundred years before I was born....and the grief and memory are still alive and now transformed into art that will continue to speak for years to come. And see our Babe in Heaven. The reverse of this art quilt has its own story too. It was created from an old, damaged tablecloth and a colorful doily I bought in a "box lot" at a local auction house. 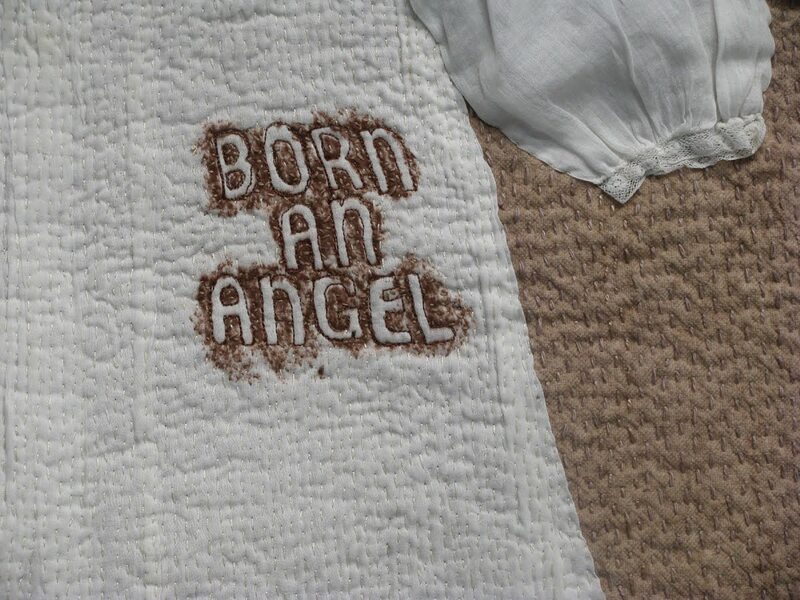 The pillowcase, however, arrived a little over a week ago. My parents were on their way to a time share in Florida and spent two days visiting us here in South Carolina. They brought several "treasures" with them, including my great grandmother's pillowcase. It had been washed and ironed so many times that the seams and fold are threadbare. It is significantly discolored. So....it now lives on as "art". 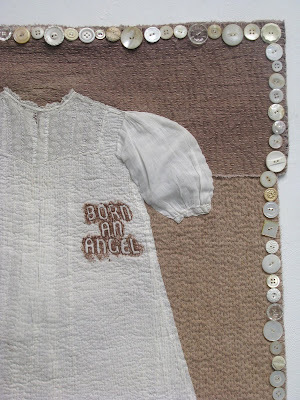 I love incorporating the handwork of former generations....anonymous and known! I also met up with one of the nice, young girls wearing one of my cemetery flower dresses at Runaway Runway on April 23. The sides are "open". I laced her into the dress....right over her shirt and jeans. 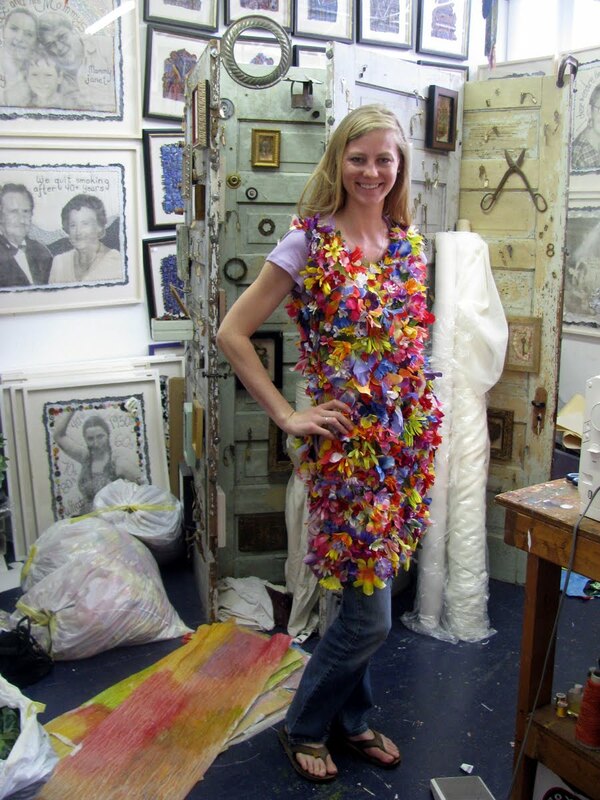 At about six feet tall, she looks like a model wearing a very stylish Easter dress. I can't wait to see her in it "for real". And....finally....I put a few quick stitches in these dyed-to-match recycled wedding party shoes. My sister Sonya wore them at a friends nuptials, years ago. I "saved" them from the trash, added a yellow-green artificial flower recycled from the cemetery dumpster along with a bead and a few sequins. 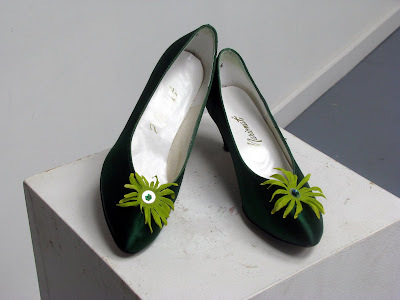 They are PERFECT for my "leaf dress". 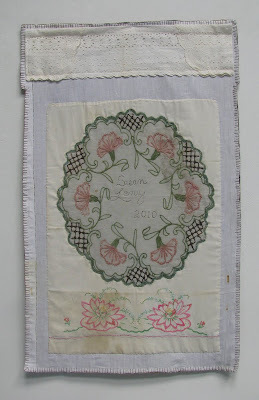 By the way, Sonya is the person who now owns and operates The Cultural Studies Academy, a summer studies program to Salzburg, Austria where I'll be teaching a contemporary embroidery workshop....please visit the information on my blog's side bar!! Wow!You certainly did some stitching while you were over here! 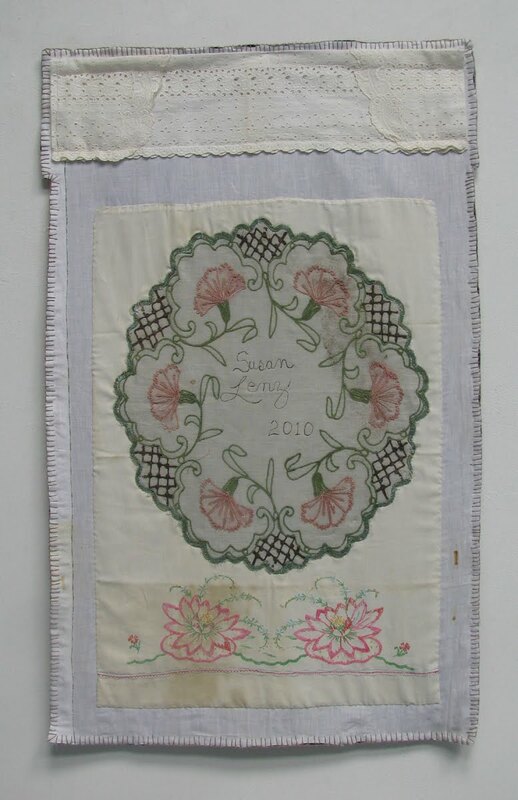 It's amazing to see this Grave Rubbing Quilt finished having had the privilege to see it as a work in progress. The epitaph is very moving. Congratulations on the dumpster flower dresses too, they look fantastic and the shoes are just right. 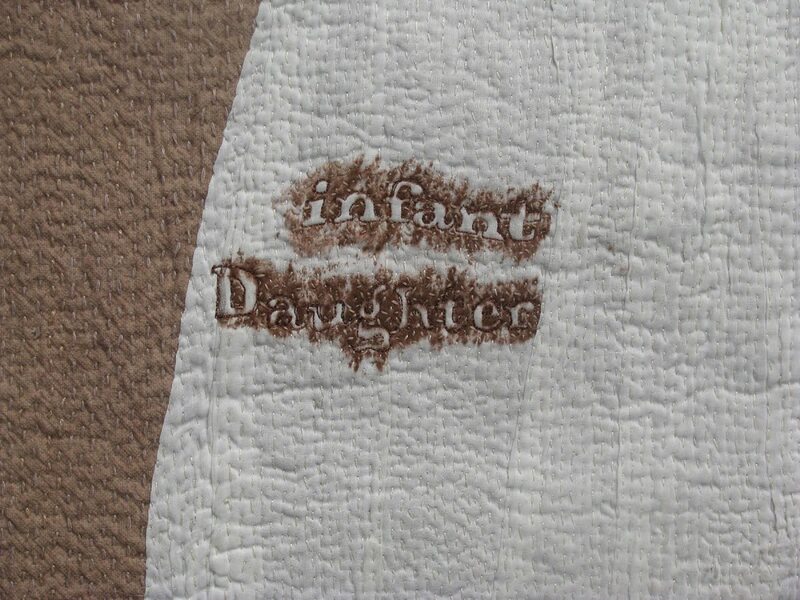 I can see the tide turning on your quilts. I really love the idea of incorporating living things from the past, known and unknown. And I know that you find and receive these treasures and, sooner or later, you know exactly where to use them. Very nice work. The baby dress is eery and comforting at the same time.